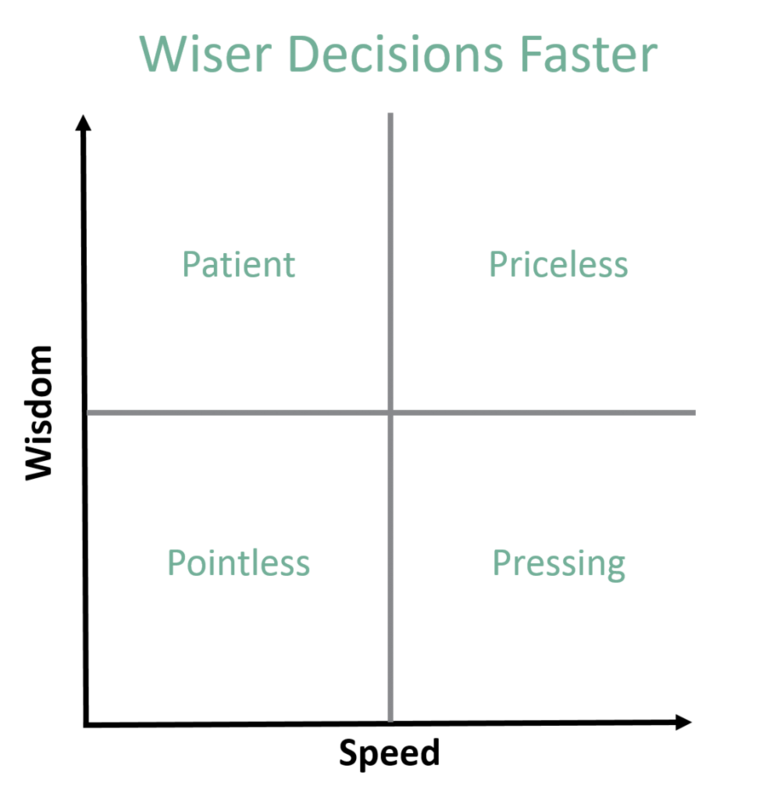 If we are interested in making wiser decisions faster, how does patience fit in? There is clearly a tension between patience and speed – it’s one that I experience in my practice almost daily. Thoughtful, unhurried reflection is so valuable. It can lead to more insightful, informed decisions. It moves us beyond “top of mind” recall, leading us to a deeper and more complex considerations. (If you’re interested in learning more about this, have a look at The Organized Mind by Daniel J. Levitin.) It also honours people’s need for processing time, individually and certainly as a group. Yet we don’t always have the luxury of time to let a group gel or an idea unfold organically at its own leisurely pace. Not only is the speed of life accelerating, but the opportunity cost of bringing groups of people together to deliberate is increasing. Meetings are expensive! Even more than that, it is energizing for people to feel like they are being productive and accomplishing a lot in a short time. We lack patience for patient processes. My interest is in creating conditions where we can find a sweet spot that balances wisdom with efficiency. One such condition is developing the discernment to know when a we need to take more time. Patience at the right moment can lead to efficiency in the long run. Go slow to go fast. But in the moment, in the boardroom or in a workshop or even around our family dinner table, how do we really know when to let things linger and when to push for resolution? Are there ways to accelerate the development of that “sixth sense,” or must we be patient in awaiting its arrival? I suspect it’s both/and… just like patience and speed.